It is almost impossible to speak of the history of Carter County without mentioning the impact that the Bemberg and N.A.R.C facilities once had on our area. As you drive along West Elk Avenue in Elizabethton, the northern skyline is outlined with the smoke stack and empty shell that represented the largest employers that have ever called Carter County home. Beginning in the 1920's a German based company came to the banks of the Watauga River to begin a unique industry that would cause the city of Elizabethton to have the largest decade of growth in its history. The journey began in the early 1920's when a German rayon manufacturer came to east Tennessee in search of a building site to produce a thread that was similar to silk. The Company was J.P. Bemberg and was an affiliate of Vereinigte Glanzstoff Fabriken (VGF), one of the international giants in the production of rayon. The decision to build a manufacturing facility in Elizabethton was finalized sometime around 1925 . A small groundbreaking ceremony was held at the selected site with Max Kroff digging the first scoop of Carter county soil. Construction of the original building would take a little more than a year. During this time the American Glanzstoff Corporation was formed. Some of the contributing factors to VFG's decision for coming to this area were the promise of an unlimited water supply and an abundance of cheap local "non-union" labor. The word glandzstoff is a German word that translates into the English phrase "bright material". In October of 1926, American Bemberg began the manufacture of what was called "artificial silk," which was also known as rayon. The first rayon produced was shiny but demand for a more dull luster forced the developers to refine their process. Over the next few years the processes would be improved and a smaller thread was produced. The American Glanzstoff Corporation had already learned the importance of flexibility in an ever changing market. This ability to adapt to changing demand would play a vital role in the survival of the two plants. Bemberg would enjoy early success. The area workforce, although mostly uneducated, would prove to be reliable and fast learning. Within a matter of months, VFG would make the decision to bring a second manufacturing facility to the area. The new facility would be called American Glanzstoff (eventually becoming N.A.R.C.) which began operation in August of 1928. The second facility would make a very similar product to Bemberg but would use an entirely different process called "Viscose Processing". The name of the product was "Lion Brand Rayon". The offer of plentiful jobs, decent wages, and cheap housing would cause the largest population explosion in the history of Elizabethton. After observing an unbelievable rate of growth to our area during the first 10 years of the plants existence, it was estimated that the city would reach a population of more than 150,000 by 1950. This dream would not be realized to to the Great Depression during the 1930's. If you notice in the aerial photo of the two facilities, most of the land surrounding the plants was still used for farming. During the first few years, the plants were considered to be out in the country and a couple of miles from town. The roads leading to the facility were not very busy and the parking lots for the plants were small. This was due to the fact that multiple car families did not exist in those days. Many of those who were lucky enough to own a personal vehicle were dropped off at the gate by a family member. Arial photo of North American Rayon Corporation with Bemberg in the background. For those who could not afford private transportation other choices were available. Many of the people either carpooled or rode a bus line that was created for the sole purpose of transporting employees to and from the two plants. Even the ET&WNC "Tweetsie" railroad would become an important form of transportation of textile workers for the two facilities. By the end of 1928 the number of employees working at the two plants exceeded 3000. Workers were commuting from several neighboring communities. Over the next several years the plants would experience many fluctuations in demand but the workforce would continue to grow until it reached its peak of 4500 employees in 1939. With such a large workforce, as expected, the two facilities would be plagued with labor disputes. In the late 1920's the workforce would accept representation from the United Textile Workers of America. Local 1630 of the United Textile Workers Union of America (UTW) was formed. The two facilities would be very successful for several years and continue production through the "Great Depression" and World War II. As one would imagine, a German-backed facility in the US during WW II would bring concerns and issues of its own. This would cause ownership questions and in 1942 the Office of Alien Property (OAP) assumed management of the factories. 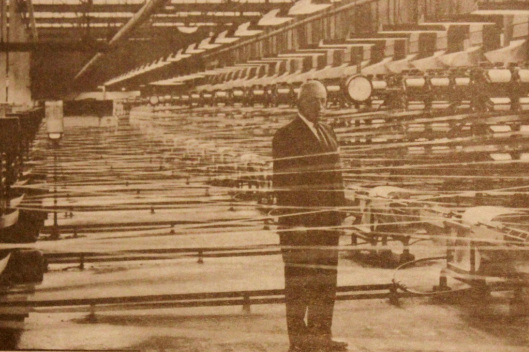 Inventor Dr. Hugo Hoffman standing around Continuous Spinning Machines he invented. Demand during war time spiked with the manufacturing of parachute cord at the Bemberg facility but after the war, demand would drop to an all time low. The ability to adapt to a changing market would prolong the life of the two facilities. By 1950 the demand for rayon would decline and the ability for both plants to be flexible would be vital. The Bemberg facility would begin making polyester and the North American Rayon Corporation would begin making nylon. Both facilities would change owners several times over the years and on February 16, 1974. Bemberg would finally loose its battle with declining profits and would close the doors for the last time. The North American Rayon Corporation would continue to work but only at a fraction of the volume it once produced. The NARC facility would struggle through the 1990's with only a few hundred workers. On February 25th, 2000, an enormous fire would break out in the facility that would make national news and burn for almost a week before being contained. This would prove to be the end of the North American Rayon Corporation and what was left of the facility was demolished to make way for a Super Wal-Mart the following year. The now deserted Bemberg building is still a part of the Elizabethton skyline as seen in this recent photo taken at dusk.